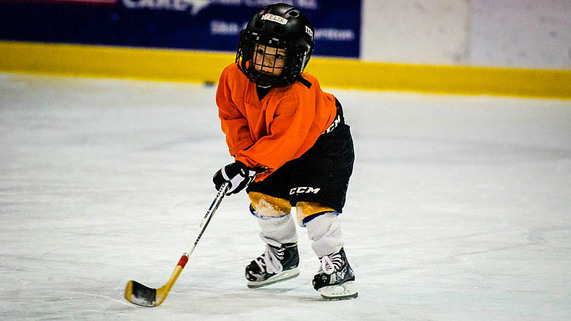 For new youth hockey players ages 4 to 13, this program focuses on skill development without the pressures of competition. The curriculum is designed to introduce beginners to the game’s basic skills using small student-to-teacher ratios. Participants are introduced to the skills of skating, passing, puck control and shooting. Children learn through participating in practice drills and informal scrimmages under the direction of certified USA Hockey coaching staff. Players will learn on a cross-ice section once per week. All participants of Youth Intro to Hockey MUST have a valid 2018-2019 USA Hockey Membership number. You can register for a USA Hockey Membership number at www.usahockeyregistration.com. All coaches are USA Hockey registered/certified coaches. The Eugene Generals Developmental Ladder provides a clear and succinct route of development, showing players and parents alike our step-by-step process that has been carefully cultivated to provide Jr. Generals players with the utmost opportunity for physical and athletic development in a fun and encouraging environment. Players are given tangible, visible goals that they are challenged to achieve so they can progress to the next rank and continue their hockey development.